"The approach of this book is great. 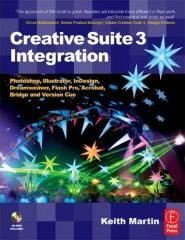 It really highlights the strength of Adobe Creative Suite 3: the integration of the products. Readers will become more efficient in their work...and find new tips and tricks as well!" -Ginna Baldassare, Senior Product Manager, Creative Suite 3, Adobe Systems Inc.
To start with, the Be Found pages explain in detail how to optimise your site for better search engine performance. Improve your site's search engine ranking and avoid the pitfalls without spending a penny on SEO specialists! The Search Secrets pages (also known as the Google Secrets pages) show how to put the power of the world's best search engines to work. This will help you find precisely what you're looking for. Creative Commons: the future of copyright? So what's the deal with the Creative Commons? What does this mean for content owners and content users, how does it work out in reality, and is it the future of copyright? Read the Creative Commons pages to find out. Whatever you do, the odds are that sooner or later you’ll need to produce some amount of printed material, and almost certainly in a hurry. Whatever it is, short-run digital printing is what you’ll need. Gamma is what determines how displays handle different brightness signal values. This sounds pretty dry, but understanding gamma is the key to understanding how to prepare images for use in Mac or PCs, and in print, web or broadcast TV. Be prepared for some technical intensity, but don't let that put you off reading Gamma Explained. PHP Explained is the beginner's guide to PHP, the powerful and popular web server scripting language. This is written for people with no previous experience at scripting, although a very basic understanding of web page structure is assumed. Make your web pages intelligent and interactive, make your own form scripts, and so on. MySQL Explained is the beginner's guide to MySQL database use. This is a companion article to PHP Explained. Learn the basics of setting up and using a table in an industry-standard MySQL database, and how to build it into your own web pages. The low-down on how to understand Freeway and get the most out of this designer-friendly web site layout software.